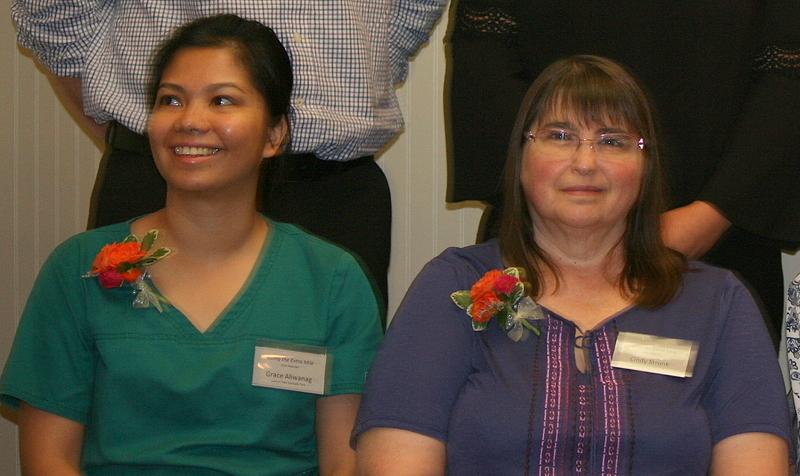 Grace Aliwanag (left) of Lantern Park Specialty Care and Cindy Strunk (right) of Crestview Specialty Care were recognized Thursday, June 16 at the third Annual Going the Extra Mile ceremony hosted by the Johnson County Long Term Care Quality Committee. This ceremony recognizes outstanding CNAs as nominated by their respective Johnson County LTC facilities. Cindy has been employed at Crestview for 36 years and “her work ethic and love of helping others has made her a stable force at Crestview”. Grace has worked at Lantern Park for the past five years and “has been an honest and trustworthy employee who exhibits Care Initiatives Core Values on a daily basis”. The awardees were recognized by the Johnson County Board of Supervisors at their board meeting and Mercedes Bern-Klug, committee chair, told the audience that Johnson County is the only county in the nation that does this type of recognition for CNAs. Cindy and Grace each received a gift bag, $100 and a door prize. This type of recognition reinforces the importance of the service provided to our community members. Congrats, Cindy and Grace!